Be one of seven personalities vying for ultimate control of this proud and pestilent city, using your cunning and guile to complete your secret agenda. Along the way you'll encounter wizards, assassins, watchmen and thieves... all of whom will affect your fortunes and continually change the fate of this mercantile metropolis. Each visit to Ankh-Morpork promises a unique player experience, combining rich visual stylings and multifaceted gameplay. A finely detailed map and over one hundred individually illustrated cards depicting the city's most beloved and infamous characters, locations, and organisations immerse the player in Discworld's most unruly city. Use your cards to enlist minions, inhume the competition, and extort money from fellow players, but beware of random magic and nefarious actions dealt by your opponents that threaten your rise to the top! Ankh-Morpork blends the distinctive humour of Terry Pratchett's best selling novels with strategic challenge and a dose of mayhem into one devilishly addictive Discworld adventure for two to four players. Suitable for all the family, you don't have to be a Discworld fan to play this game, but you might end up as one! Devised by internationally renowned games designer Martin Wallace and a dedicated team of artists overseen by the Discworld Emporium. 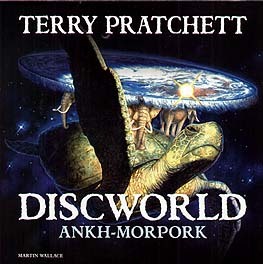 This was the first Discworld game I have played and it is my favorite out of all of them. Each player is attempting to take control of the city. Each player has a hidden identity role card. This could be Vimes run out the draw deck to win the game, Chrysophrase have $50 either in cash or buildings or both amongst other roles. Each Player is starts with 5 cards in there hand and these cards have a series of actions on it. The action icons can either contain money from the bank, remove one of another players minions from the board, remove a trouble marker another action can be to build a building in a city you are in that does not contain a trouble marker. The price ranges from $6-$18 for that building, when you have built in a city you will gain a city card that activates from your next turn. Game ends if one of the players meets there objective at the beginning of their turn. You don't have to be a discworld fan to enjoy this game but it is really enjoyable and a must have! This is the only Discworld themed game that I have played. In this game each person is attempting to take control of the city. At the beginning of the game each player is dealt a personality card all of these have different objectives by which to win the game. Each Player is provided with a hand of cards these are then used to take actions. The actions you perform on your turn are based on what icons are on the cards. If you are lucky enough to be able to gain a city then you gain control and get a city card - the cities provide the controller with additional bonus functions so one could give you money etc. I like the game because it plays really well, it is quick and there is an element of bluffing as players try to hide their unique objective. I think as you play this more you will become more adept at hiding who your personality is and what your unique objective is to win the game, if you are playing against people who have already played this alot then they may be able to pick up on who your personality is so there is an element of leading the other people up the garden path a bit! I really enjoyed this game - like the other reviewer said I don't think you necessarily have to like or even know about the Discworld in order to play the game however having said that with me having a small appreciation of the world I was able to enjoy it more as I knew something about the characters. Good game another recommendation. Another Discworld themed game where players are vying to take control of the city in the absence of Lord Vetinari. Each player is given a different personality at the start of the game, all of whom have different objectives to win the game by. Players have a hand of cards which they use to take various actions denoted by icons on the cards, the components and artwork are superb. The game plays really well and there is a lot of player interaction as you try to hide your objective with your actions, hoping to distract your opponents long enough to complete your win condition. The various areas of the city provide different abilities to the players who manage to control them. There is a card for each city area outlining their functions, which the controlling players takes to show the areas they control. The cards can be used to aid your cause, but sometimes can be used to scupper your opponents, but use with caution as they will almost certainly be returning the favour. The game plays quite quickly and with experience you will be able to hide your objective better from other players. This is good fun, provides much amusement during the turns and suits its theme quite well. I do not feel you need to be a fan of Discworld to play or enjoy this game but it will certainly help you get more from the humour and atmosphere of the game.